Beetroot vegetable belongs to botanical family Amaranthaceae and the scientific name of beetroot is Beta Vulgaris. Most common type of beetroot is round in shape, red in color but yellow, stripey & white types of beetroots are also available. Russia, France, Turkey, China and Germany are large producers of Beetroot. Beetroot is sweet to taste but it's leaves are bitter. Beetroots are also known as Red beet, golden beet and table beet. Beetroots are low in calories and high in fiber. You can make juices, fruit salads, and different recipes with beetroots. Beetroots come in different varieties such as Formanova, Chioggia, Golden, Lutz Green Leaf and Detroit Dark Red. 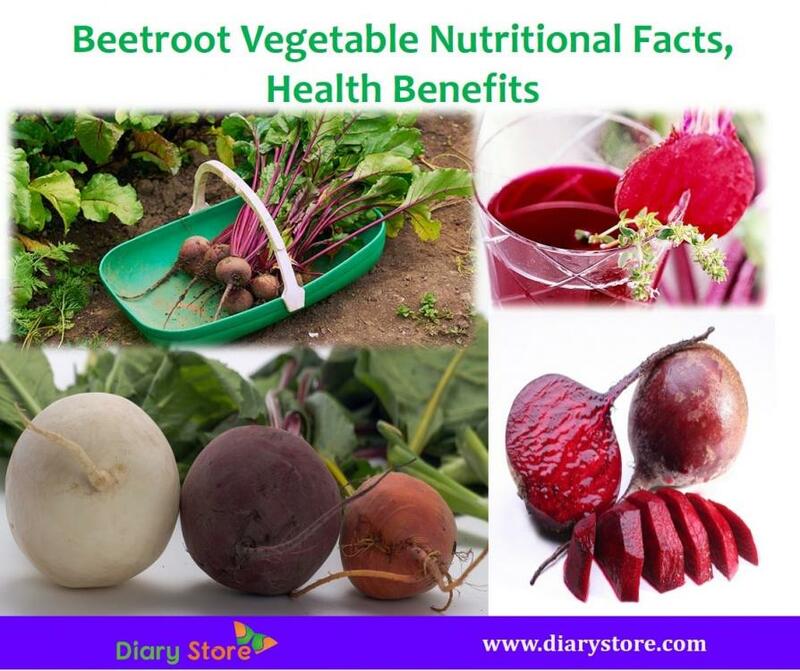 Beetroot has innumerable nutrients. Beetroot contains 0.155mg (3% of RDA-Recommended Dietary Allowance) of Pantothenic acid, 0.334mg (2% of RDA) of Niacin, 0.031 mg (2.5% of RDA) of Thiamin, 4.9 mg(8% of RDA) of vitamin C, 109 µg (27% of RDA) of folates, 33 IU( 1% of RDA) of vitamin A, 0.329 mg (14% of RDA) of manganese, 325 mg (7% of RDA) of potassium, 16 mg (1.5% of RDA) of calcium and 0.075 mg (8% of RDA) of copper. 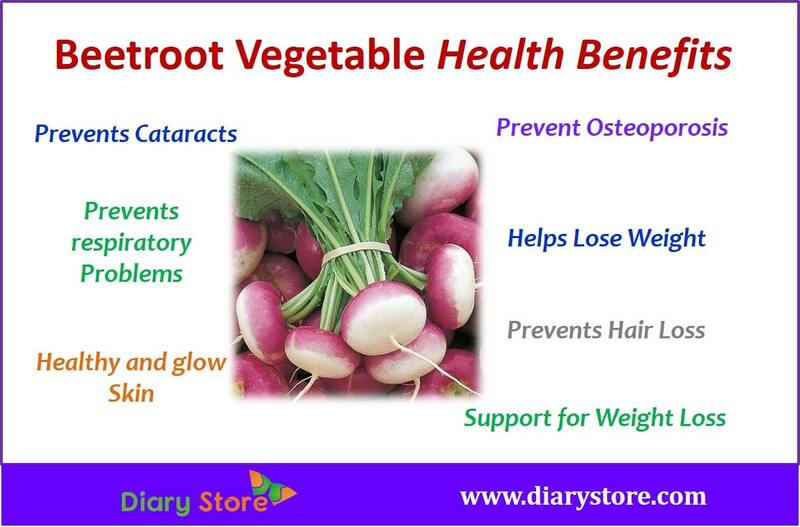 Beetroot has amazing health benefits. Beetroot contains high amount of fiber which helps to reduce the triglycerides and cholesterol in our body. Triglycerides increase the risk of heart problems. So, consume beetroot weekly once as it reduces the risk of heart attacks and strokes. Beetroots are good source of antioxidants. Vitamin A helps to prevent age related blindness and macular degeneration that commonly occurs in older age. Beetroot Vegetable contains high amount of vitamin C which helps boost the immunity system and stimulates white blood cells and also fights against viral, fungal, bacterial, protozoan toxins and other related infections. Beetroot Vegetable juice and raw beetroot is good for skin. Drinking a glass of beetroot juice purifies blood and gives you healthy and beautiful skin. You can also apply the juice on your face regularly to remove dead cells, oily skin, wrinkles and make your skin soft and supple. Here you can read more about on tips on Healthy Skin and Skin Beauty Tips. Nitrates and silica are presence in beetroots. They convert nitrates into nitric acid in the body. These minerals help to prevent osteoporosis. Drinking daily a glass of beetroot Vegetable juice can keep osteoporosis away. For more understanding on symptoms, ill effects of osteoporosis and complete prevention, read the post on Osteoporosis Symptoms, Prevention tips and Side effects. 4. Which Vegetables Are Better To Eat After Cooked or Raw? Beets loaded with fiber when eaten raw make you feel full and prevent you taking more food. Beetroots are great food for those who want to lose weight. We have provided more details on shedding extra weight in the previous post Weight Loss Exercises and Experts Tips. Beetroot Vegetable has good source of potassium. Potassium helps to promote hair growth. For prevention of loss of hair, retention and nourishing the existing hair we have to follow Experts Tips. Read our previous post on Hair Loss Treatment, Hair Style Tips. Those who suffer from malfunction of gallbladder or kidneys are warned against consumption of beetroots because it may result in formation of unwanted stones in gall bladder and kidneys.